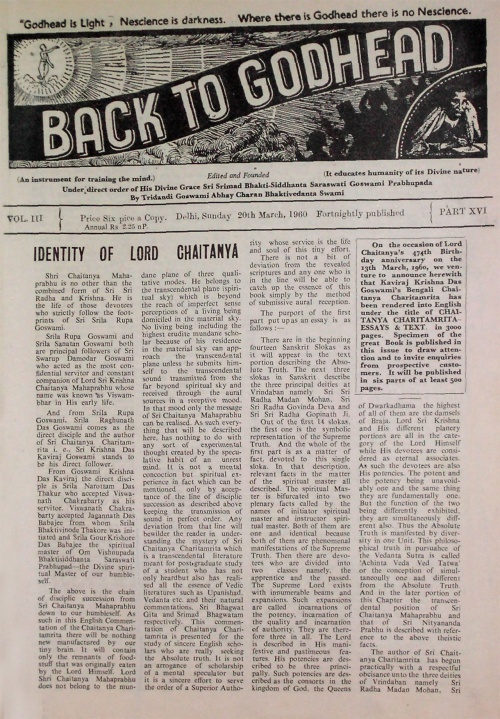 On the occasion of Lord Chaitanya's 474th Birthday anniversary on the 13th March, 1960, we venture to announce herewith that Kaviraj Krishna Das Goswami's Bengali Chaitanya Charitamrita has been rendered into English under the title of CHAITANYA CHARITAMRITA-ESSAYS & TEXT in 3000 pages. Specimen of the great Book is published in this issue to draw attention and to invite enquiries from prospective customers. It will be published in six parts of at least 500 pages. This page was last modified on 16 April 2017, at 15:28.